21 Days of Gastronomy Heaven in El Puig de Santa Maria; VÍ Vid reports from Huerto de Santa Maria. Yesterday 11 May saw the start of the Jornades Gastronòmiques in El Puig de Santa Maria which last until 1 May and where 7 local restaurants show a series of plates on their menus which reflect the local produce, traditional dishes and dishes which are heavily based around Semana Santa (Easter Week) which is at the heart of the 21 days. El Puig is a town rich in history, 15 minutes to the North of Valencia and easily accessed by the V21 or A7 (bypass) by car /15 mins), or Line 6 on the Railway It has a small market on a Thursday and it was here that Jaume 1 planned the conquest of Valencia. There are the Royal Monastery to visit (where the Royal family still hold official receptions in their private suite), its museum of Printing and Graphic Arts , the Cartuja d’Ara Christi and more modern underground refuges and trenches from the civil war. The town is almost the most Northern in the Horta Nord county of Valencia, rich in the growing of fruit and vegetables which allow many of the local restaurants to claim KM 0 status for the ingredients they use in their dishes. Famous for its rice dishes ( Fetge de Bou https://wp.me/p7dfvi-1Bo), Arros Caldoso de Acelgas (chard) Arros de Pollo, Conejo y Caracoles, ( with mint – not rosemary) Paella de ‘Busca’ ( literally a paella made up from whatever workers on their way home could find in the ‘marjal’ (frogs, birds, cabbage, onions, peas, artichokes or eels). It is famous also for its ‘ollas’ or stews. ( The marjal is a strip of land, a natural margin between the sea and the land stretching down the coast from Sagunto towards Valencia and is rich in wildlife). Yesterday mornings presentation was held in the Huerto de Santa Maria complex to the South of the market square and Royal Monastery. Each of the restaurants participating explained a little about their philosophy and the menu they were providing during the Jornades. The event was sponsored by Mascleta beers. Marisma, Playa del Puig. 17€. Torrijas con helado de calabaza. Tartare de Fresas con sopa de leche merengada. Coca Valenciana de Sardina con tomate, cebolla y brotes verdes. Filete de Lubina de Cuscus Negra. Chefs or representatives from 5 of the restaurants participating. We recommend booking ( especially in Holy Week) but on the basis of the plates we sampled during the presentation and the photographs above you are guaranteed an excellent tourism visit and gastronomic experience wherever you decide to go! We recommend you try it! Journey to Verdú & Cantó Saffron Spain, in the prime on life, a young company more than 125 years old. VI vid reports from Novelda. There are many myths and legends about saffron … What do you know about this “red gold”? What is saffron good for? Since its properties were discovered thousands of years ago, saffron has become one of the most expensive and appreciated spices. The origins of this Company date back to 1890 when Mr. JOSÉ VERDÚ CANTÓ goes on his first journey to the fields of La Mancha region to select from among the crops the best batches of saffron and market them in several countries. Nowadays it is a leading company in the selection, packaging and marketing of saffron, spices and seasonings, which it markets in over 45 countries. Their product range has extended to other spices and condiments such as paprika, blends of spices or salts in grinders and botanical cocktail ingredients, developing of a broad range of innovative presentations adapted to the needs of the consumer, building renowned and prestigious brands as POTE, ZAFFERANIA, TOQUE and SYREN. This family-owned company has pioneered the strictest analytical controls starting with the arrival of the prime material, obtained from the best batches of saffron straight from the farmers, up to the final product. To this end, all development procedures are aimed at obtaining results that improve the quality of every single product, maintaining its quality and purity guarantees. POTE brand has been part of home cooking for generations but was born in difficult times, after the Spanish Civil War. Its excellent value for money has been the key to filling so many dishes with color, aroma and flavour. A brand that has passed a life-time of Spanish generations. It was the first ground saffron in the market and it is the secret that fills the homemade recipes of much of our cuisine with color and flavor. Hand-picked in the various fields which account for most of the region ́s scenery, ZAFFERANIA ́S saffron can boast an appellation of origin protected by La Mancha ́s saffron ruling Council. A certification which guarantees its origin as well as its penetrating aroma besides its delicious taste and the unmistakable color of each filament. These precious filaments have always been historically considered to be the best saffron in the world. SYREN is their leading brand in the Arab market, also present in much of the world. It is a real guarantee of quality and compliance with the strictest Verdú & Cantó standards. The Syren production is selected from the best crops, with its characteristic strand size, floral and scent. The Syren range also includes different products made with saffron such as almonds, tea or honey. With TOQUE, under the slogan “LIFE with a SPECIAL TOUCH,” they believe it is possible to convert a boring dinner into an exotic dinner, between a simple drink and a creative cocktail, between routine and adventure, and that you can travel without leaving the table. Because Toque is the small details that change it all. Their grinders allow the consumer to regulate the size of the input to your liking. In this way you get the freshly ground spice size you are looking for with its aroma. Verdú & Cantó have a selected range of ethnic flavours, from Thailand to the Caribbean, with stops in India, Morocco, and Italy that add a dash of intense International flavour to your dishes. TOQUE Botanicals for Mixology is their firm commitment to the barmans trade, a decision that has a lot to do with the philosophy of their brand Toque, the search for top quality ingredients and the development of innovative products for both domestic and professional use are part of their strategy to implant the love for creative cocktails in both National and International markets. It is a collection which is designed to be directly added to your mixed drinks, without the need for any unnecessary preparation of the herbs, thus ensuring a clean, safe and identifiable end result. Verdú and Cantó have signed with Pepe Orts to create a collection of botanicals for catering and to advise the new creative mixologists that join their community, he is the prestigious specialist barman known for investigating different botanicals and their use in cocktails. If anyone knows how to give a special touch to the drinks it is certainly him. Few chefs can count on a Michelin star and possibly none of them know as much about saffron as this chef and entrepreneur. Referred to by The New York Times as “The Saffron Queen” María José San Román is the best ambassador for their saffron throughout the world. With her, they study new culinary applications to create both traditional and innovative recipes to claim the value of saffron. We went to her restaurant “Monastrell” for lunch, where she showed us the different ways to use the saffron in all her dishes. Bodega Dehesa La Luna: VÍ Vid Visits the Biodiversity Project in La Mancha. Occasionally VÍ Vid are invited to visit Bodegas outside the Valencian Community and last week on Tuesday 26 March such an opportunity came up to join a small group of press colleagues on a visit to La Mancha. We had been invited to visit Bodega Dehesa La Luna near La Roda (Albacete), a new project on 3000 hectares of virgin land in the Campo de Montiel. The vast majority of the land is given over to the flora and fauna indigenous to the area and can count on a wealth of wildlife on the land encircling the new vineyards. Here one can observe birds of prey including Imperial and Royal eagles, Peregine falcons, Goshawks, Kites, Great bustards, and many other birds including wild duck and skylarks plus wild rabbits and hares. During our tour of this reserve we also saw partridge and a wild cat bobbing across the track ahead of us. Some 800+ hectares are given over to agricultural projects such as Olives, Cereals Almonds, Pistachios and Honey, all of them organic and the family Group also includes Extrem, the Extremadura based company producing the excellent Jamons and Lomos of Bellota fed Iberian pigs and Chorizos and Salcichons. The harvesting of the cereals and other farm products is very respectful to the life cycle and nesting needs of the birds for example. The vineyards are similarly managed with no chemicals used and the cuttings from the pruning are used as a natural form of composting which helps protect the soils from the sun and wind. Just 63 hectares are dedicated to vineyard production, again fully organic and certified since February of last year. The vineyards were first planted in 1998 but significant new planting took place last year as well. The Vineyards have a mix of varieties including Tempranillo, Cabernet Sauvignon, Garnacha, Graciano and Aglianico (an Italian variety being evaluated which is rustic and acidic and best known for the Basilicata DOCG ‘Aglianico de Vulture’ wines) in red and Viura, Garnacha Blanco, Sauvignon Blanc, Chardonnay and Viognier in whites. Perhaps most interesting are the vineyard practices as they are applied in support for the vines. We are all familiar with a drive through La Mancha, where extremely neat plots of vines often low in height and ‘en vaso’ populate the open landscape. Newer vines are often supported ‘en espaldera’. At Dehesa La Luna all varieties of support are being trialled, well, seven different styles. Firstly the vines are all restricted to a single branch on which six buds are allowed to develop. These are exactly one meter apart, the branch stopped pruned to where the next trunk rises so no space is wasted. The different styles of support are ‘sprawl’,’ semi-sprawl’, ‘vertical’, ‘vertical shaft’, ‘espaldera’, ‘vaso’ and ‘Geneva Double Curtain.’ Each has its own manner of controlling the height and orientation of the overhanging and extensive growth which are good for absorbing solar energy and to protect the vine and the developing grapes from the excess of sun and are key in current studies into climate change and its effects. As the vines are currently dormant, ( the vineyards are some 900 metres above sea-level there is no growth at this time of year and the vines have barely started their weeping, signifying the sap is starting to rise) it is difficult to show the ways in which the growth can be controlled differently. Essentially there is a simple double-click mechanism which raises or lowers and fixes the wires at a different height to allow sunlight in or keep it out by lowering the branches back over the grapes. In the Bodega José Luis Asenso the technical director vinifies the wines separately allowing for blending the varieties and by varying the amounts to try to maintain a consistent style of each wine each every year. Again no chemicals are used in the process. The Bodega is typically spotless and modern with its stainless steel temperature controlled deposits and oak cones and the barrel room enjoys glass walls so that visitors can observe from the reception, dining and tasting room. A system of micro-humidifying takes place to keep the air moist and control the temperature of the ageing. Starting with the Garnacha Blanca 2017 (5%Viognier) we tasted a number of the bodegas wines. Pale gold, clean and bright this has a luscious aromatic nose with tropical notes, a distinct note of hydrocarbons (like a good Riesling) and a lot of white stone fruit such as apricot, peach and lychee. In the mouth the citrus notes and acidity are excellent, balanced by apricot, peach and pepper and is deep and round. The Rosado 2018 from the same range is 100% Cabernet Sauvignon is pale salmon in colour and is clean and bright. on the nose there is red fruit but it is still a little closed.The entry is good, nice ripe red fruit, with good acidity, and salinity in a long dry finish. The 2016 Origenes red is a blend of Tempranillo, Syrah and Cabernet Sauvignon, approximately 1/3rd of each. Deep black cherry in colour the Cabernet predominates on the nose, vegetal but very fine. In the mouth good, ripe fruit and round tannins. All this range is designed to be easy drinking . The Gran Luna 2015 has Aglianico, Cabernet Sauvignon, Tempranillo, Syrah and Graciano in a blend. A very deep black cherry colour, this has a very deep fruity nose, black currants, black fruit and Rowentree’s fruit gums. In the mouth it has nice acidity on entry, go0d depth, soft tannins. A truly lovely wine to drink with the Italian variety and Graciano adding a fresh touch. The Tempranillo 2015 is a more medium to deep bodied cherry red. With expressive black fruit on the nose, in the mouth there is a touch of alcohol with good round tannins. This was accompanied by an aperitif of Ibericos from the Extrem range and then a Gazpacho Manchego with partridge, rabbit and hare, followed by a salad of partridge escabeche and for dessert, Torrijas. VÍ Vid would like to thank Pedro Mocholi and Francisco Ruiz De La Torre Esporrin for the invitation and hospitality. These wines will be added to our cellar! Bodega Sierra Norte Celebrates its 20th Birthday: VÍ Vid Reports from the Mestalla. It is hard to believe that Sierra Norte, the Utiel-Requena based bodega with interests throughout the Valencian Community and Jumilla has reached just its 20th birthday! Nonetheless this was celebrated with a tasting of the new wines matched with a selected buffet from Jamones Gargallo on Monday 4 March in the prestigious VIP balcony of CF Valencia´s Mestalla stadium. Distributors, the wine press and other guests were invited to enjoy a convivial evening and learn of the bodega´s new major announcement. After three hard years work it will soon be possible to visit the bodega famous for its Pasión range of mono-varietals amongst other wines. Later in the Summer, probably in July, Sierra Norte will open the Casa Calderón, a new bodega on the site of a late Victorian historical predecessor with previous owners including the Mompo family (original Grao exporters) and home to the ‘Dominio de Arenal’, part of Vinival, who were still producing wines there in the early years of this century. The new bodega (8000sqm) will provide capacity for the bodega’s production with exciting modern, efficient and sustainable architecture and a visitor centre whilst the old site will eventually be converted into accommodation to go with the wider wine-tourism package. This will include a barrel park, for ageing the wines, a chapel, a museum, landscaped terrace and garden. The bodega is surrounded by 50 hectares of vines, which Sierra Norte are now cultivating and bringing round to their wine-making philosophy, organic and sustainable. 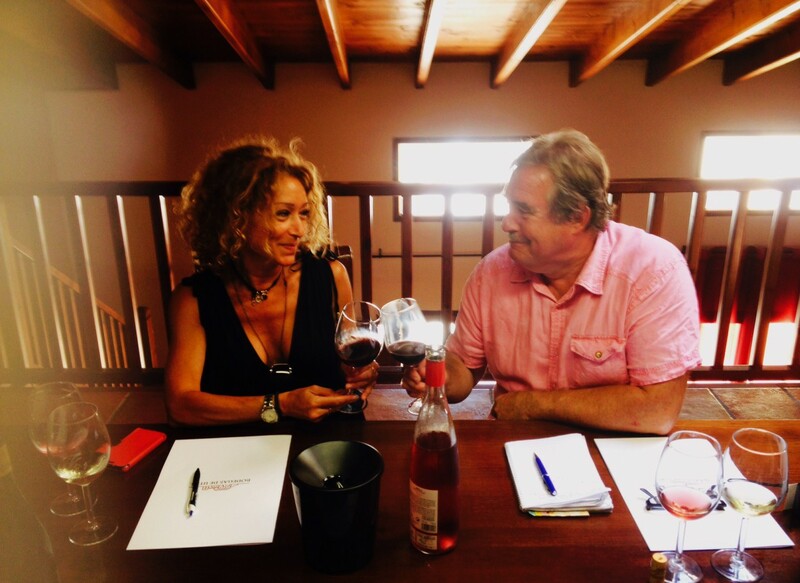 The 2018 wines will also be the first to carry the organic wine certificates which Sierra Norte have been working towards together with a certificate accrediting them as suitable for vegans. 2018 had not been the easiest year to produce wine, using careful selection of the grapes at various times and even irrigation, ‘a year of micro-surgery’ as Manuel described it! We tasted the Mariluna Blanco, clean, fresh and aromatic, the Cerro Bercial Blanco fuller and excellent with the jamon and ibericos which were served during the buffet. The Pasión de Moscatel and Bobal Rosado were also very fresh, clean and expressive. New wines were also introduced from the bodega’s other sites, Olcaviana from La Roda and Equilibrio, a range of wines from Jumilla which will include a new Sauvingnon Blanco and differing reds from the Monastrell variety. These are the result of six years work according to Manuel, with a great concentration on the quality of grapes which their elaboration requires. Indeed, the Equilibrio 9, a wine from the Monastrell variety and from vines with over 40 years of age has just won a gold medal at Mundus Vini as well as a gold at the Asia Wine Trophy . The wine has had 9 months in French and American oak. The Cerro Bercial Ladera Los Cantos, a red from Bobal with 60 years of age and Cabernet Sauvignon with 40 years has won a silver medal at the Spanish Winemakers Federation competition. This is a wine with the second (malolactic) fermentation in new French oak barrels and 18 months crianza. This was a celebration worthy of the career path and development of this bodega. We look forward to reporting further on the opening of the Casa Calderón and new wines from Sierra Norte as they come on-stream. 5º Concurso Arroz del Senyoret; VÍ Vid reports from the Ciudad de Bétera. Monday 4 March saw the Valencian Gastronomy competitions move on to Bétera and specifically Evenser Restauración on Mas Camarena. This restaurant set in the pine trees near the Technological park serves as both the restaurant for the gated housing estate and for many of the industrial and technological companies in the buildings alongside the CV35 heading West out of Valencia. This concurso saw 11 restaurants take part in one of the favourite events of the year. This seafood rice dish is named for the practice of peeling the ingredients so that the `gentry´didn’t have to get their fingers dirty. The ingredients for this special ‘Evenser’ version of the arroz is a freestyle fumet or stock, which the chefs bring with them and which generally contains small fish, red fish vegetables, pimenton, saffron. There was a general acceptance this year that many stocks contained one or two varieties of the local crabs as well. Additionally there are prawns, (langostinos) small cuttlefish, (sepia sucia) and corvina ( Meagre, Drum or Croaker). This is a delicate fleshed fish with good flavour. The arroz is made by frying the prawns, once peeled, then the cuttlefish and then the fish. The fish is generally reserved at this point to add back later in the cooking. The sofrito is added and then the rice together with more pimenton. With around 20 minutes to go to presentation of the arroz the stock is added and the langostinos and fish added to the chefs preferred style. We have followed this cooking process with pictures of the entrants from Bon Aire, Picanterra and Famolenc to illustrate the process. The morning starts traditionally with an almuerzo and this is one of the best! Traditionally Fernando from Mar Sala and his team bring their paella pans of fried potatos and onions, longanizas and eggs, eaten with ‘hogazas’ of traditional wood fired oven-made loaves of bread, patés and empanadas. Chefs, the jury, the press corps and councillors from the town mix amicably and set the world to rights before the competition commences in earnest! The jury this year consisted Jésus Melero, (President of the International Competition in Sueca) Juan Carlos Galbis, ( Master Rice Chef), Ana Iniesta, ( Evenser) Oscar Corrons (Gastronomy critic) and Juanma Romero (esRadio). As usual, the event is sponsored by the Diputación and enjoyed the attendance of Pilar Moncho, Deputy for Tourism as well as the Mayor of Bétera, Alvarez Blaya and Carlos Mataix, President of Gastronóma. Gastronóma, Valencia´s primary gastronomy event held in the Feria every November has offered an additional prize for this years competitions. The winners of the major concursos will be invited to participate in a showcooking of the Community’s top dishes during this years event. 4º Concurso de Paella de Cullera; VÍ Vid reports on Salvador Gascon´s legacy. Salvador Gascon, father of Valencian gastronomy, sadly passed away during the last year but his legacy, ‘Paella de Cullera,’ lives on! The paella is now widely available in the local restaurants and the standard of cooking is improving exponentially. The success of the paella depends on its base, a rich seafood stock with rock fish, in which scorpion fish is essential. To this are added red mullet, large prawns, squid and ‘figatells’ of scorpion fish, the aforementioned tomato and rice, garlic and saffron. 3 local restaurants take part in the competition having been selected from an eliminatory concurso held the previous week. They join 14 restaurants from across Spain who are invited to participate. Bon Aire de El Palmar. Catering La Despensa de Burjassot. Nou Racó de El Palmar. Arroces de Guillermo, Ciudad Real. Macario, Tavernes de la Valldigna. San Bernado, Tavernes de la Valldigna. Seafood paellas do not need the same length of time to cook as many of the other competition dishes we follow. The figatells, prawns and squid are gently fried to give them some colour and soften the texture, then removed from the oil. The tomato, pimenton and garlic are added to make a sofrito then the rice is added to absorb the flavours. The stock is slowly added to the level the chef requires and then as this approaches cooking point the fish, figatells, squid and prawns are added back as the ‘arros’ is dressed. Al Grano from La Cañada. Following the Competition there is a Gala lunch, hosted this year in the Holiday Hotel, attended by the chefs, press and invited dignitaries from the Diputación, Francisco Mulero (Autonomous Secretary for Agriculture) and Pilar Moncho, (Provincial Deputy for Tourism). The Jury was led by Paco Franco and included Michelin starred chef Miguel Barrera, Lebanese chef (Lamina’s Kitchen) Lamia Chehayeb and fellow blogger Cova Morales. After the awards have been made we enjoyed a meal of baby octopus with tomato and artichoke, morcilla croquettas with all-i-olli of membrillo, sardine with caramelised onion and toasted bread, Paella de Cullera and a dessert of Orange with fresh fruits. This was accompanied by the excellent wines from Nodus, a Chardonnay, a Bobal and a Cava. The competition goes from strength to strength with the judges finding their decision more difficult each time! 1º Concurso, Paella de Fetge de Bou y Postres de Cacau de Collaret: VÍ Vid reports from Meliana. Following ‘Menja´t Meliana’, the 2nd year Meliana has celebrated a coordinated week of gastronomy in the towns restaurants, the event finished on 25 February with the first competition and 18 restaurants cooking a paella with beef liver in the Town Hall square. This paella is unusual in that it is found only in the towns of the Horta Nord of Valencia, Alboraya, Meliana, Tavernes Blancas, Massamagrell etc. It is a winter dish and traditional at the time of the matanza following the Festes Taurinas after which the bulls were slaughtered. The liver, heart and sweetbreads were reserved for the traditional paella eaten afterwards. Bulls liver, 100gm, heart 100gm, sweetbreads (lleterola) 100gms and skirt 100gm. 2 x lettuce (escarola) . There is an excellent video on El Racó de Meliana´s Facebook page showing Paco Gimeno, the restaurants chef cooking the paella in the restaurants kitchen. You begin by frying the diced meats in olive oil and adding the guindillas (the number depends on their heat, 1 or 2 should be sufficient ) and adding salt. Then add the chopped garlic, pimenton and tomato and continue frying until it has taken on all the colour. The chopped escarola lettuce is added in a pile on top, continually stirred and cooked down until it almost disappears. The water is then added (up to the rim) and your stock begins to concentrate. During this period of cooking further pimenton and salt may be added. When the stock drops below the handle rivets of your pan the rice is added. The aim is to produce a rice dish which is ‘mellosa’, that is to say it is not dry but equally is not sloppy, it should have a shiny appearance and have a little concentrated liquid. The paella has the potential to be very dry because of the meat. The more of the lettuce is used it has the effect of turning the dish into something altogether more soft in flavour and tender in texture, adding to the flavour but reducing some of the concentration of meat flavours and softer in consistency. It gives a paella which is still strong in flavour and perfect for a winter dish..as the Spanish say it is ‘contundente’ or powerful! Miguel and Juani, L’ Alcudia. La Cigrona i +, Valencia. La Barraca de Montoliu, Meliana. Paco Gimeno of El Raco (Meliana) also cooked a demonstration paella but did not participate in the competition as his colleague and brother Javier was on the jury. The morning commenced as usual with the selection of cooking turns for the 18 restaurants and the traditional almuerzo. Then the restaurants started to produce their dessert entries. This competition was free-style, the entry only having to be based around the Cacau de Collaret, another of the traditional products from the Horta Nord. The Cacau as it is known here is the shortened version of ‘Cacahuete’, or peanut and is a vegetable which was dying out here until aficionados like Toni Montoliu of Meliana started to do his best to revive them. The seeds are sown in Spring and the plant harvested through Summer until November. It has twin fruits inside the shells and the superior quality and flavour of the local product is indisputable. Unfortunately it is simply not a crop which appears economically capable of mass production locally and is therefore prone to the International competition it faces. Nonetheless it is versatile in its use (which as well as its indispensability in almuerzos) in ice-creams, turrons, tarts and other traditional confections here in Valencia. 3º Tabick Lounge de Llombai. Prizes were awarded by the Mayor, José Riera Vicente and the Vice-President of the Diputacion María Josep Amigó Laguarda amongst others and the event was sponsored by the Diputación of Valencia, Cervezas TURIA, Empresa Peris de Foios, Ecoama, Xufatopía, Denominación de Origen Vinos de Valencia, Turisme de Carraixet and the Ayuntamiento de Meliana. Commenting on the competition the vice president thanked the organisers for creating a competition which showed so well the products and gastronomy of the Horta Nord and offered the Diputación´s full support for the competitions continuity. Following the competition and the award of prizes the contestants, jury and press retired to El Racó de Meliana for a gala lunch. On the menu were Pan con Aceite to accompany a salad of encurtidos, vegetables and Caballa, Alli Pebre and Croquettas de Alcachofa. This was followed by Paella de Fetge de Bou, a dessert of Cacau de Collaret and Cremaet accompanied by the excellent wines of Bodegas Angosto (DO Valencia).